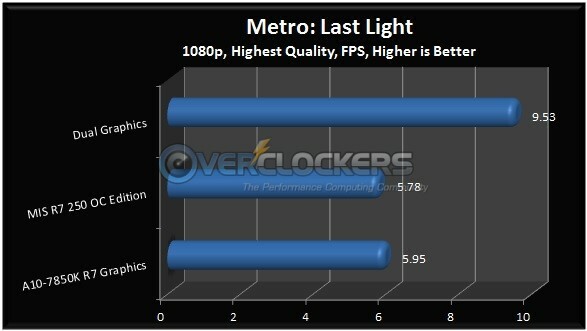 There has been a lot of talk surrounding AMD’s Dual Graphics of late, especially since the release of the Kaveri APU lineup. 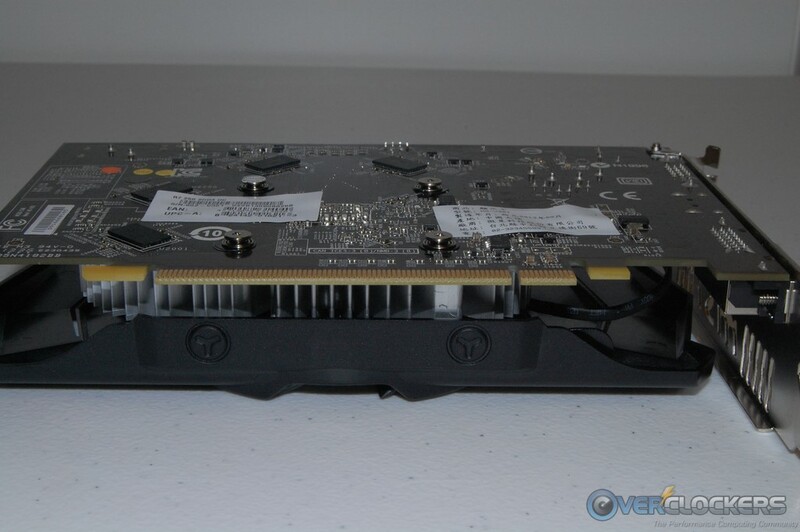 Today, we’re going to explore the performance gains that can be had by leveraging the Kaveri A10-7850K’s built-in R7 graphics with a R7 250 discrete graphics card. AMD is constantly pushing affordable gaming to higher levels, and Dual Graphics with the latest Kaveri APUs is another example of this effort. 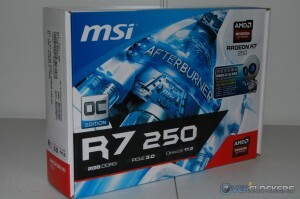 AMD sent along an MSI R7 250 OC Edition graphics card to test with, which is the series they recommend pairing with the A10-7850K. 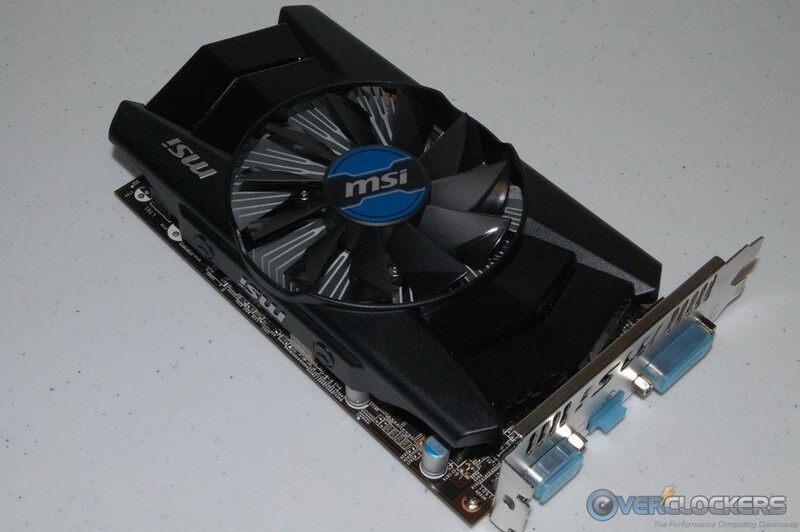 So let’s get going and see what Dual Graphics brings to the world of low cost gaming! 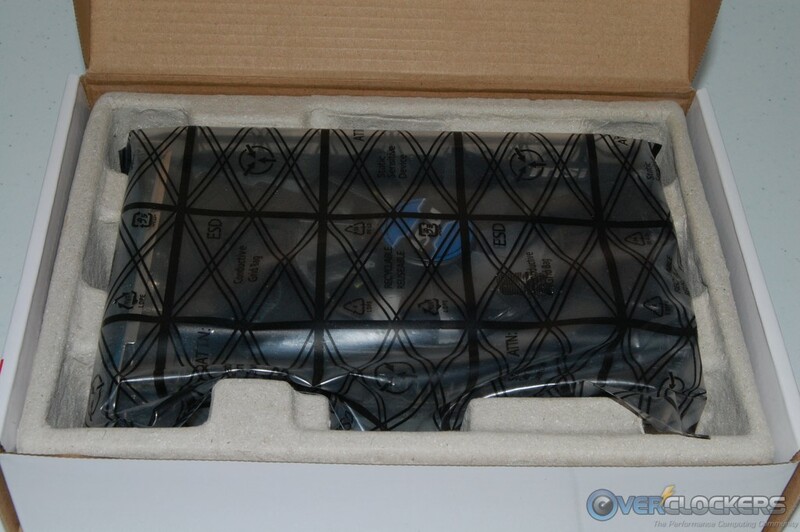 We’ve already published a detailed review on the Kaveri A10-7850K, so we won’t spend time repeating what’s already been covered. If you haven’t yet read that review, click the provided link to be taken there. 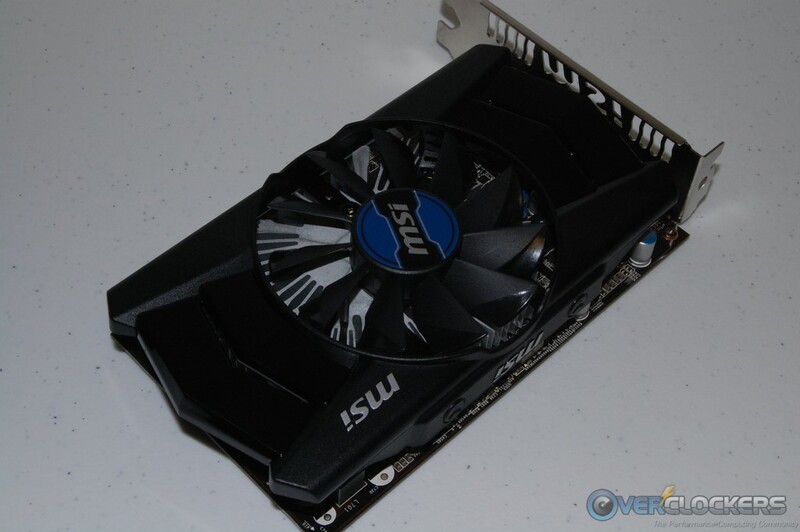 This article isn’t intended to be a full review on the MSI R7 250, but we will provide you with some pertinent information. 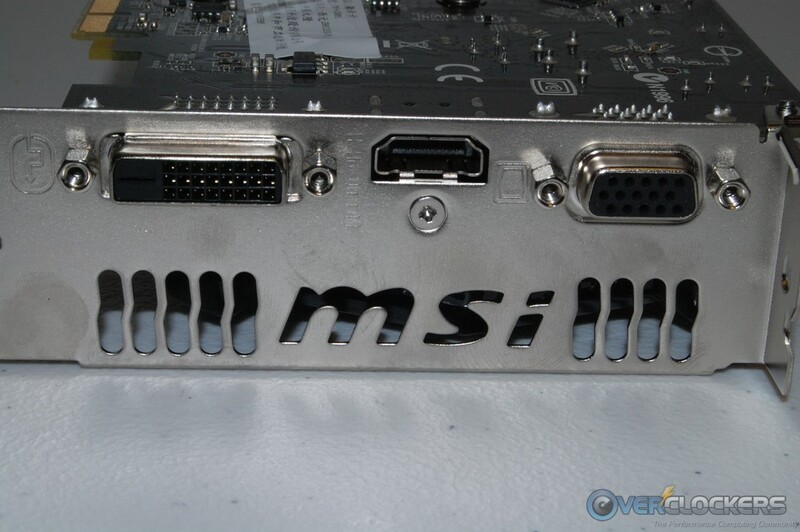 We’ll start by giving you the specifications as provided by the MSI website. …And here is a quick list of the key features. 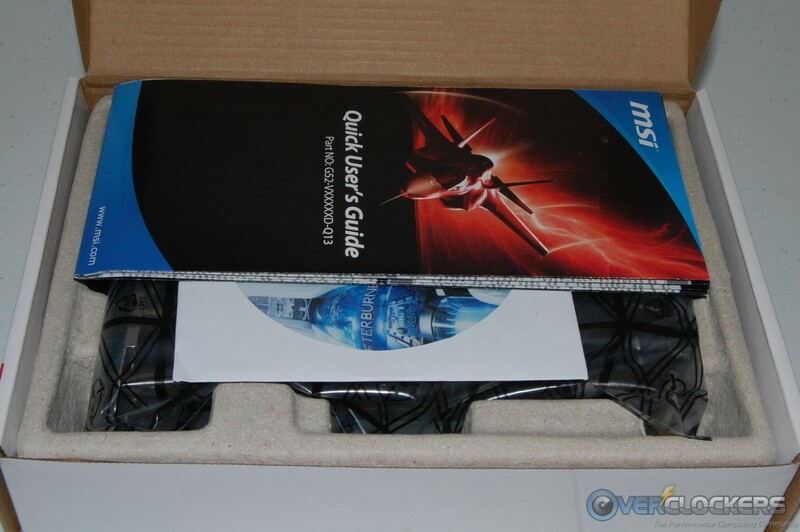 – MSI’s exclusive Propeller Blade Technology. – Stereoscopic 3D display/glasses and Blu-ray 3D support. – Stereoscopic 3D gaming support. – 3rd party Stereoscopic 3D middleware software support. Of note here is the increased clock speed from the reference design of an additional 50 MHz. 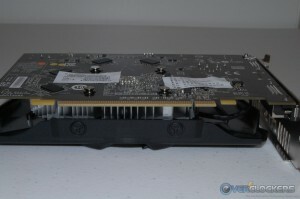 The card also features 2 GB of GDDR3 memory, whereas most reference design cards are outfitted with 1 GB of memory. 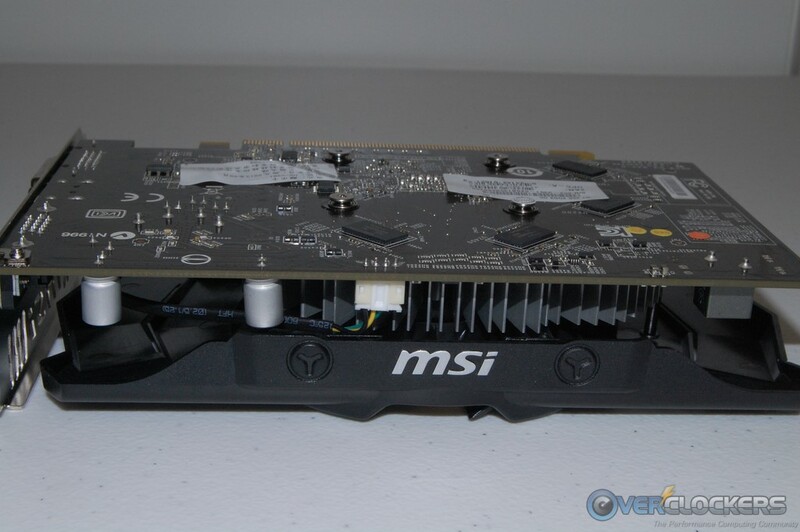 So, while the card is one of the lower end R7 offerings, it’s been beefed up a little for added performance. The red, white, and blue themed box does a good job of explaining the product inside. The front has some nice graphics and high level specifications, while the back gives a more detailed list of features and specifications. Inside the box, you’ll find a quick user’s guide, along with a driver/utility CD. 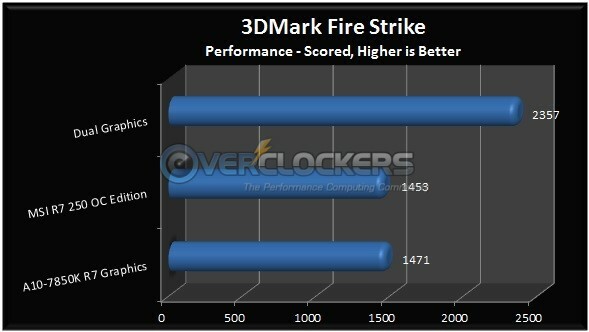 Obviously, the utility is going to be MSI’s popular Afterburner overclocking software. 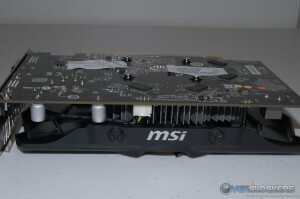 Below is a set of pictures of the MSI R7 250 OC Edition. You’ll notice there is no auxiliary power required, and the card will run solely from the power provided by the PCI-E slot. 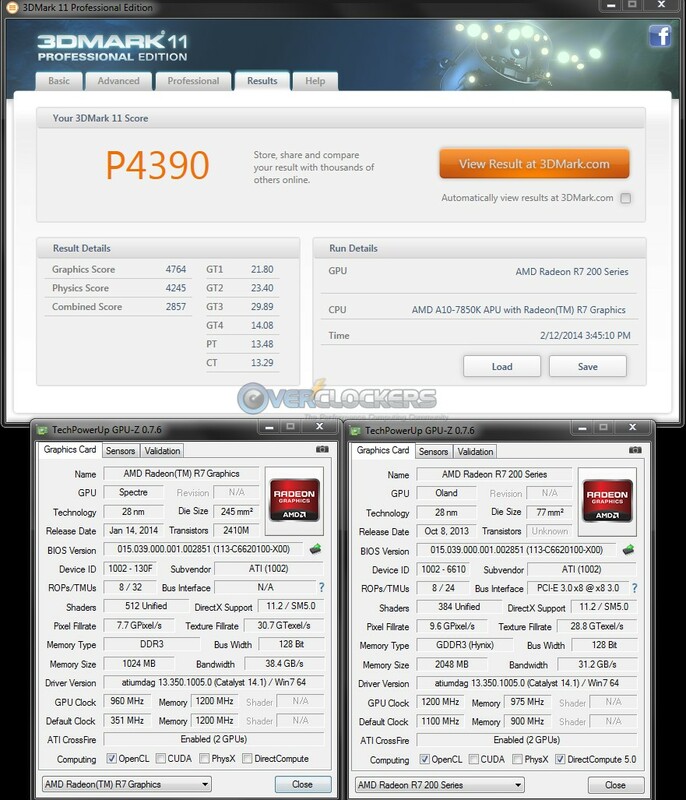 The 2 GB of DDR3 memory is Hynix H5TQ2G63DFR. 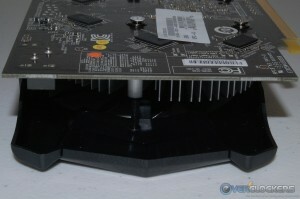 The cooling apparatus features MSI’s Propeller Blade technology and sits atop a solid aluminum heatsink. There has been a lot of discussion about what exactly will work when pairing a Richland or Kaveri APU with a discrete video card. 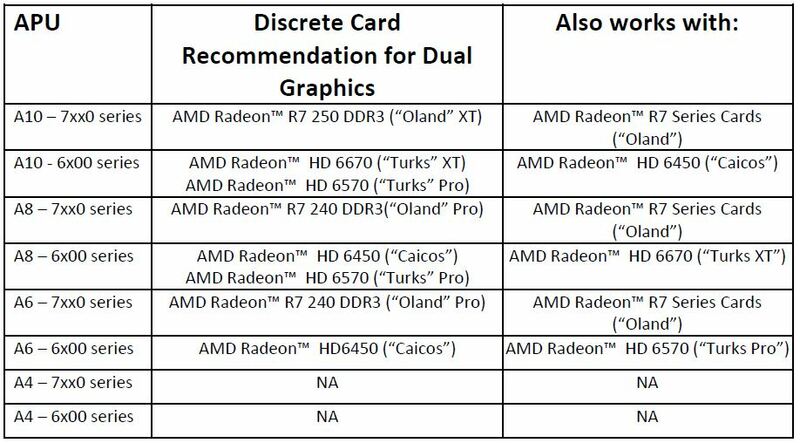 For Dual Graphics to work correctly, according to AMD, you’ll need to adhere to the table below. 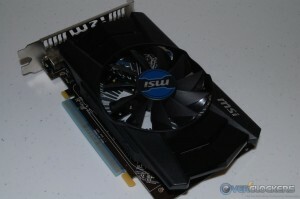 AMD states that R7 250 graphics cards with GDDR5 should also work fine. 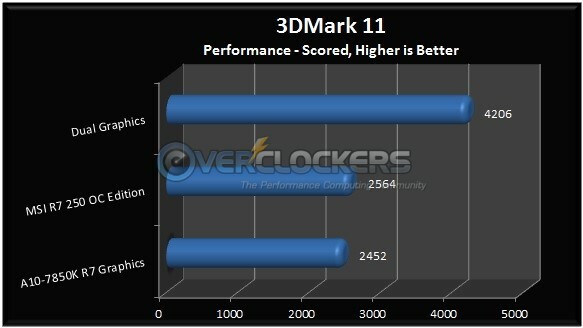 The drivers AMD sent along for testing are version 14.1 Beta 1.6, which also include frame pacing enhancements. 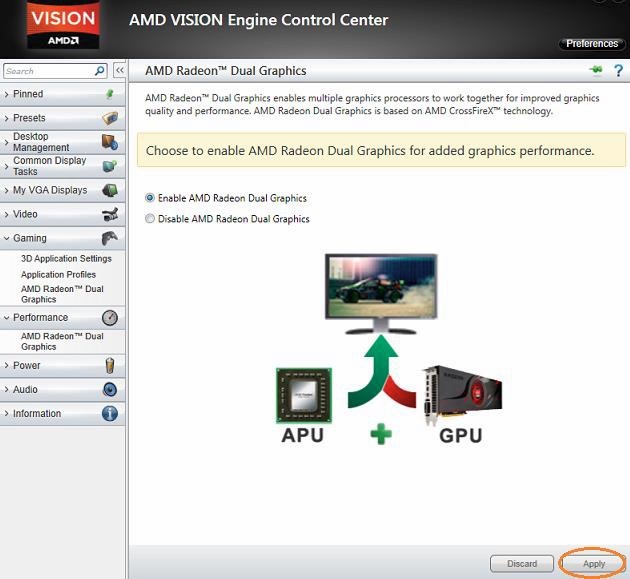 AMD claims these enhancements will allow for a smoother experience when Dual Graphics are enabled. 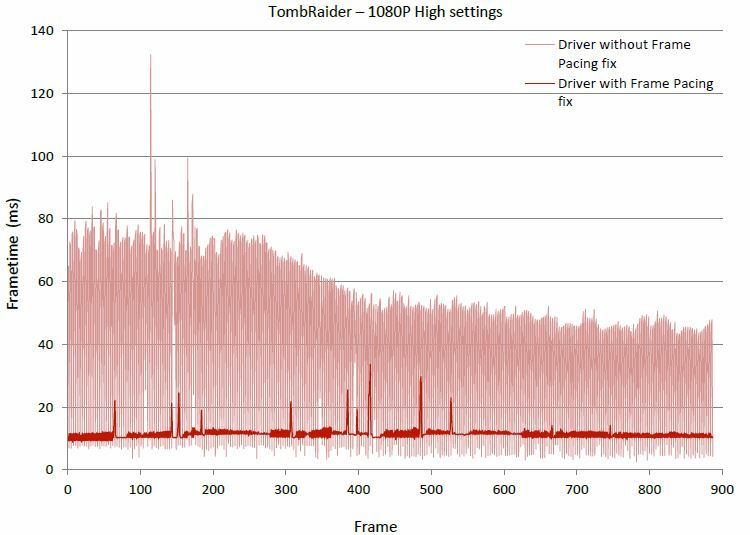 AMD performed some in-house testing using Tomb Raider to illustrate the frame pacing enhancements. For those running Crossfire setups, it should come as good news that AMD is aggressively pursuing a fix for the “runt” frame issue that was reported several months back. Once the discrete card is installed, all that’s needed to activate Dual Graphics is a quick trip inside Catalyst Control Center. From there, you can enable Dual Graphics from either the Gaming or Performance tab. If you wish to confirm that Dual Graphics is enabled during game play, there is an option to enable the Dual Graphics status Icon. To enable the icon, simply right click on the CCC icon in the system tray, and enable it from there. Dual Graphics will only work while gaming in full screen mode, and you will see the icon in the upper-right hand corner confirming Dual Graphics is in effect. Dual Graphics will not work if your game is running in windowed mode. Our intent today is to show the benefit of using Dual Graphics over the R7 iGPU, or just the discrete R7 250. 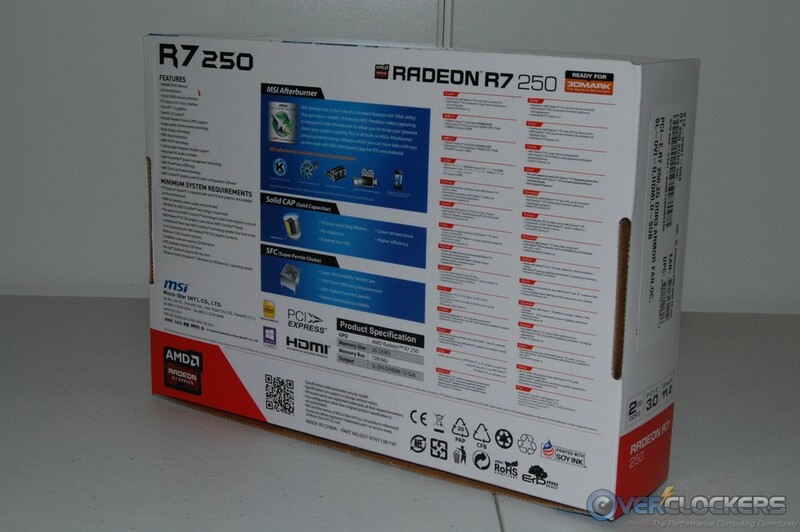 With that in mind, we’ll compare results using just the APU’s R7 graphics, just the discrete R7 250 video card, and finally, both of them together with Dual Graphics enabled. Because a new set of beta drivers were introduced for improving Dual Graphics, I used those same drivers to test all three scenarios. The frame pacing option was enabled for the Dual Graphics testing. As we usually do, we’ll take no prisoners and run all three of these scenarios through our updated GPU testing procedure. If you’re not yet familiar with our procedure, follow the link to learn more. Here is the down and dirty version of the test procedure we use. 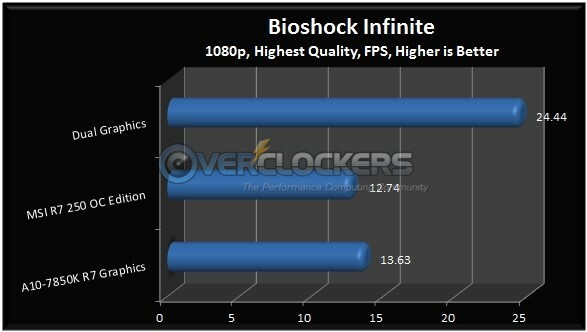 Starting with our synthetic testing, there are huge gains to be had with Dual Graphics enabled, as witnessed by the below charts. 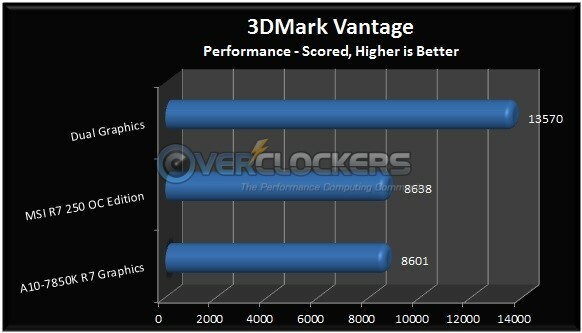 It’s interesting to note that the APU’s on die R7 graphics actually scored right on par with the discrete R7 250 OC Edition. 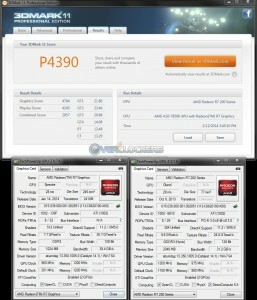 So, if you were wondering what discrete card the Kaveri A10-7850K’s iGPU most directly compares to… here’s your answer. 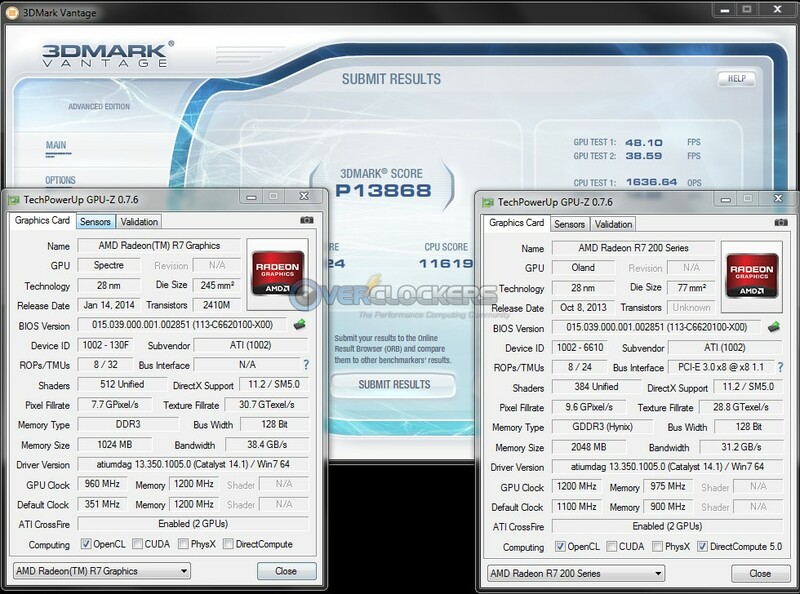 Our game benchmarks show the R7 250 OC Edition and the R7 iGPU swapping victories; and as expected, the Dual Graphics shows impressive gains throughout. While these raw FPS numbers might not look that impressive, you need to remember, all these games were set to their highest settings. 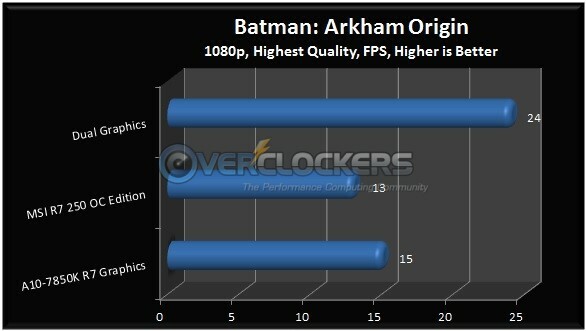 If you lower a couple of settings, you’ll easily get a very playable experience at much higher FPS. If you’re wondering what settings get you these very playable FPS, I present you with a PDF file from AMD showing examples of what settings can be used for many of today’s popular game titles. (Click here for the file). 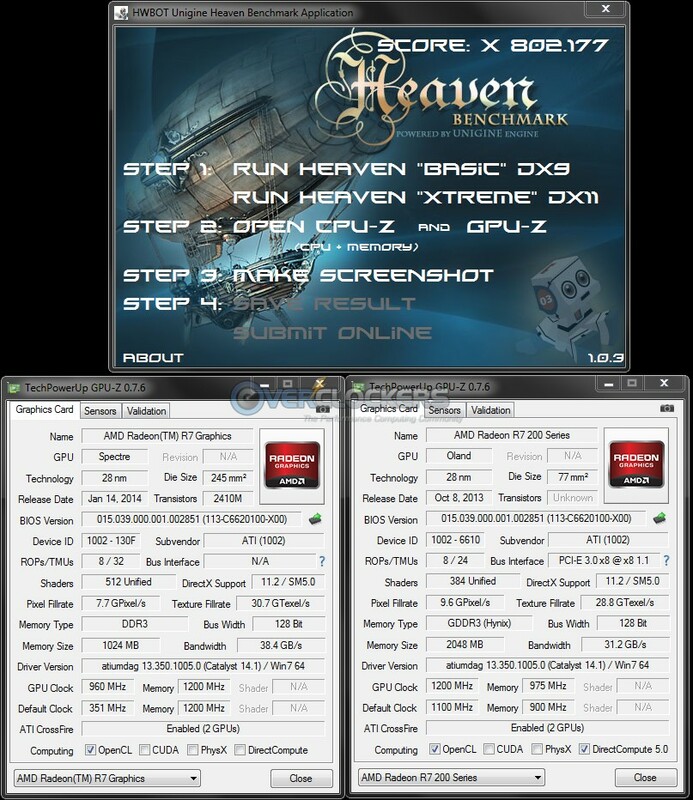 Being that the thrust of this article is how to setup, use, and show what gains can be expected from Dual Graphics, I didn’t spend much time overclocking. However, I did spend a few minutes tinkering about. 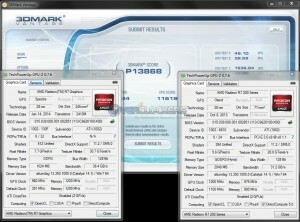 Just as a teaser, I overclocked the iGPU core to 1000 MHz in BIOS. GPU-Z only sees it as 960 MHz, so I’m not sure if the BIOS setting isn’t holding or if GPU-Z is reading incorrectly. I then used Catalyst Control Center to overclock the R7 250 OC Edition an additional 100 MHz core and 75 MHz on the memory. Only modest gains were noted with these small adjustments, but I’ll dive deeper into the overclocking prowess of this setup as time permits. Keep an eye on the forum post that coincides with this article for updates! 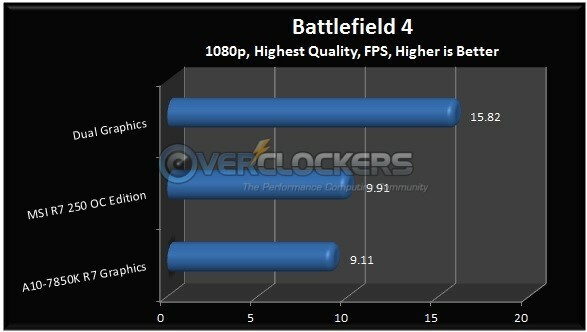 It’s hard not to like the gains we see when using Dual Graphics. 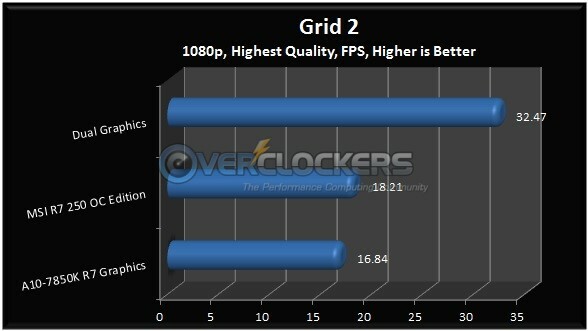 It’s a powerful tool for obtaining better graphics performance and maintaining a low cost system build. 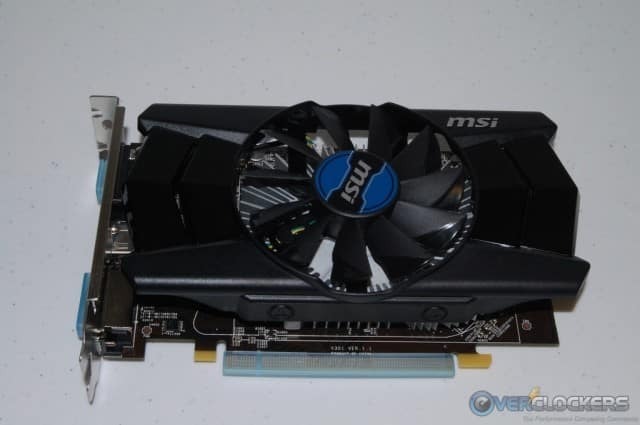 The MSI R7 250 OC Edition is currently selling for $89.99 at Newegg. To me, that’s a pretty small investment for the ability to run Dual Graphics. I certainly wouldn’t recommend buying one to use as a stand alone card, but it’s not really intended to be a serious gaming card on its own. However, coupled with a Kaveri iGPU and a few relaxed game settings, you will be on your way to a pleasurable and low cost gaming experience. If you currently own a Kaveri A10-7850K, I can easily recommend grabbing the MIS R7 250 OC Editions video card for the added Dual Graphics performance it will provide. 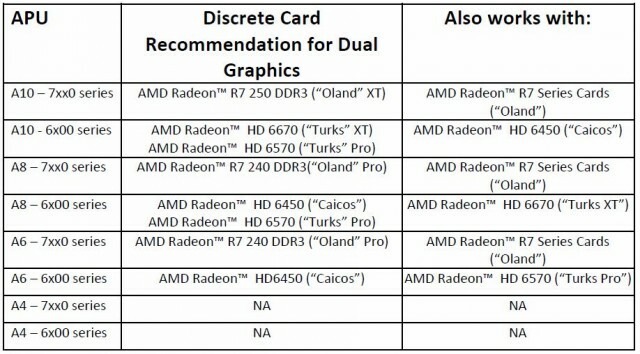 Kudos to AMD for continuing to expand the available options for budget minded gamers! 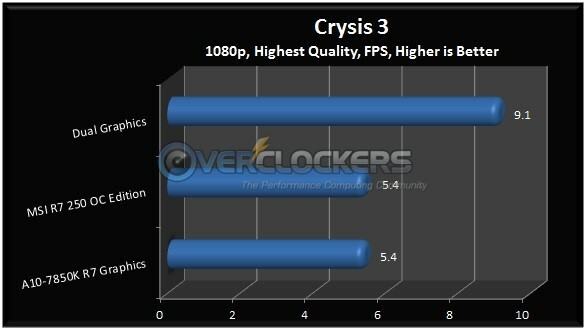 Will any AMD/ATI based video card see a performance increase when using a Kaveri APU? Or can it only be crossfired w/certain GPU combinations? The performance scaling seems to be a bit better with this generation VS the Liano generation that I played with for a while. The APU platform may not be top shelf gaming, but if your on a budget and you dont need all of the eye candy it is certainly a fair option. Thanks for your efforts on this chip Lvcoyote, as an a10 7850k owner my self it's great seeing what this chip can do. Was hoping it would work better with higher up graphics cards and that the limit is with a R7 250 that is a bit of a dissapointment. 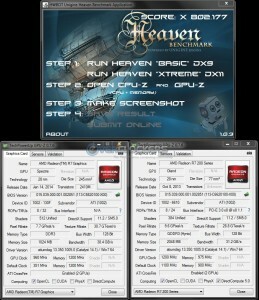 One question though, when you are overclocking the GPU side, what settings do you use? Is it NB? There should be an option in BIOS to set the iGPU speed. At default it's 720 MHz, but 1000 MHz should be easy to do with a small bump in NB voltage, or maybe no bump at all. Nice review, good to see this working well. For something like an HTPC that supports gaming or SteamBox, this sort of setup could be a very viable option. I have a Kaveri chip Jeremyct and I built it originally as a steambox with no GPU. I used SteamOS as my operating system and it worked very well, games were playable but the linux tools for overclocking just aren't user friendly or easy to obtain so I wiped it and installed windows 7 64bit and havn't looked back. Steam is loaded on the pc now and you can just go into Big Picture mode which works exactely like steam os. heh, this really makes me want the "vapor/wish-ware" rumor you always hear about AMD making an APU using DDR5 for main memory to match the Playstation4 tech. Yea I know that's totally not going to happen, but it's a fun thought. But then again there's always DDR4, I wonder how the bandwidth compares to GDDR5 in that case? Of course that wouldn't be until 1 or 2 years from now? And the whole landscape will be different then. But fun to think about. @xxror AMD says they plan but can't yet promise DDR4 APUs for early 2015. Should be interesting since the reason for the limit to the 250 may be that only DDR3 GPUs need apply for Kaveri's dual mode, that enbles better cards to be release for the 5th gens dual mode. @Lvcoyote I've seen some anecdotes that RAM speeds matter a surprising amount for Kaveri, when you get around to overclocking some tests with over or under clocked system memory would be useful to confirm or deny this. Are there any discrete cards that even utilize ddr4? I've really only seen ddr3 or ddr5 variants. What would you pair with such a system? GDDR4 was never terribly popular for whatever reason. 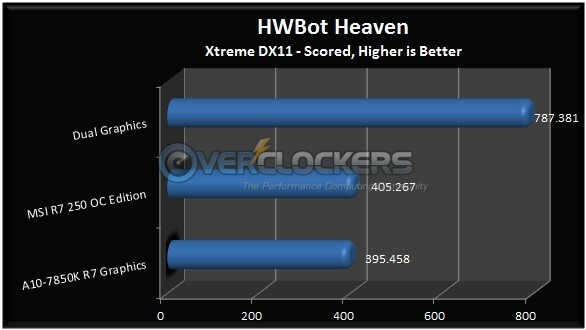 I think AMD used it on the 2900XT. It's also important to remember (since people seem to toss around the terms haphazardly) that DDR4 and GDDR4 are different memory technologies. They're not interchangeable or compatible AFAIK.